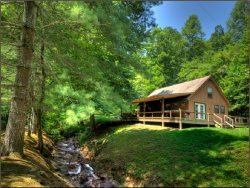 Here at Hidden Creek Cabins we strive to provide you with the best Smoky Mountain Vacation possible. Our additional services are constantly changing, however, if you'd like to make your vacation extra special give us a call at 888-333-5881 and we will be happy to help in any way we can. All of our cabins are fully equipped with kitchen appliances, (refrigerator, stove, oven, & microwave) dinnerware, cookware, and utensils. We also provide all the linens for your stay including sheets for each bed, towels, and washcloths. Consumable supplies (paper products, trash bags, soap, detergent and toiletries). We do provide a “starter amount” of these when you arrive, but it is not meant to last your stay. We also ask that you bring your own towels if you plan on doing any outdoor water activities.